In an organizational environment where there is an employee and employer relationship exists, several circumstances arise when an action is required to be taken against an employee for various incompetencies. These incompetencies include violation of attendance rules, taking too many breaks, inappropriate behavior and more. In such circumstances, managers or supervisors have to submit a write up to take anti-disciplinary action against the employee. 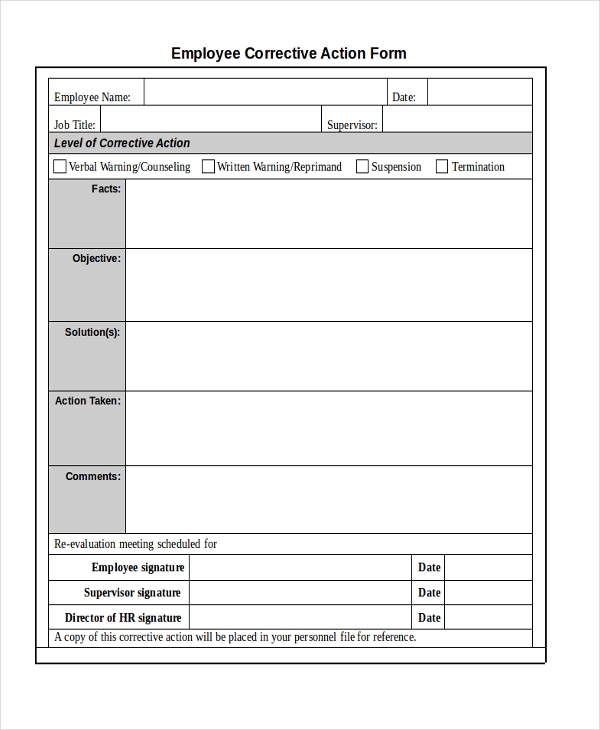 Here are Employee Write Up Forms samples available online that employers can utilize. 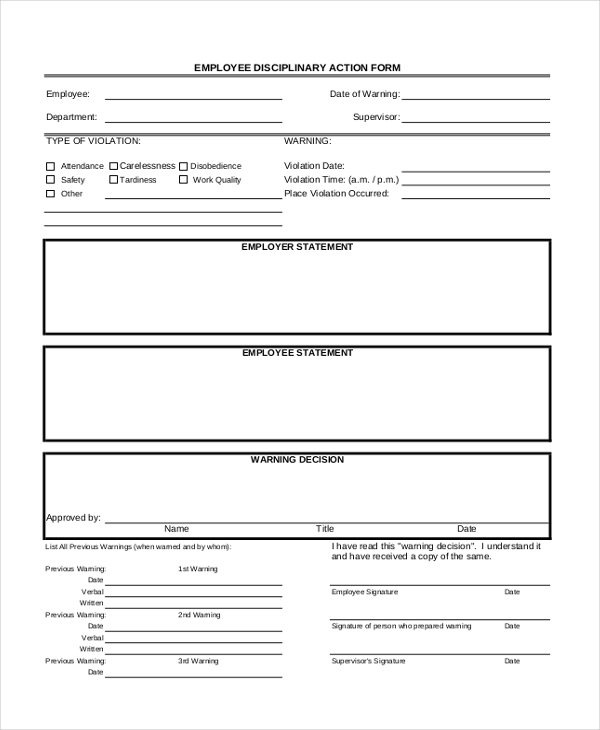 Here is your perfect employee write up form that will help managers, superiors and team heads present write up as an action against the employee who has been noticed for his/her unacceptable behavior or actions. 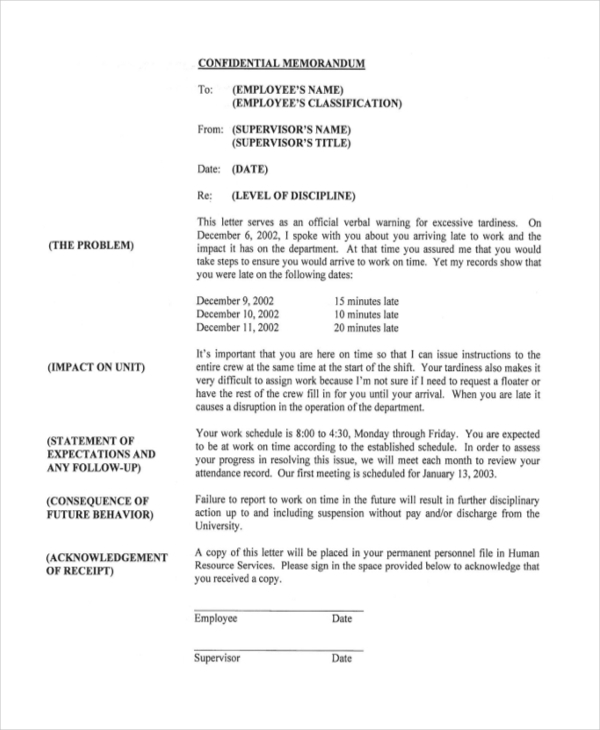 Check out this another employee disciplinary write up form and create a perfect write up to be presented to act against any employee. This form consists of various sections that let you list the employee details, the reason of write up, your name as a superior, role and the action to be taken. You may also see Sample Self Employment Forms. This is one of the longest and detailed employee write up form that comes in a printable format. It includes detailed instructions for how and when the action need to be taken against the employee along with a complete elaboration of working on write up. Are you working as a superior in a restaurant? Then you might need to write up forms to take required measures against employees found indulged in disciplinary actions. Get this restaurant employee write up form downloaded and present a suitable write up as the necessary action. Here is another solid PDF form for employee write ups designed for employers, superiors or team leaders to punish indiscipline employee through a disciplinary action. You can customize it as per your requirements. You can also see Employee Review Forms. 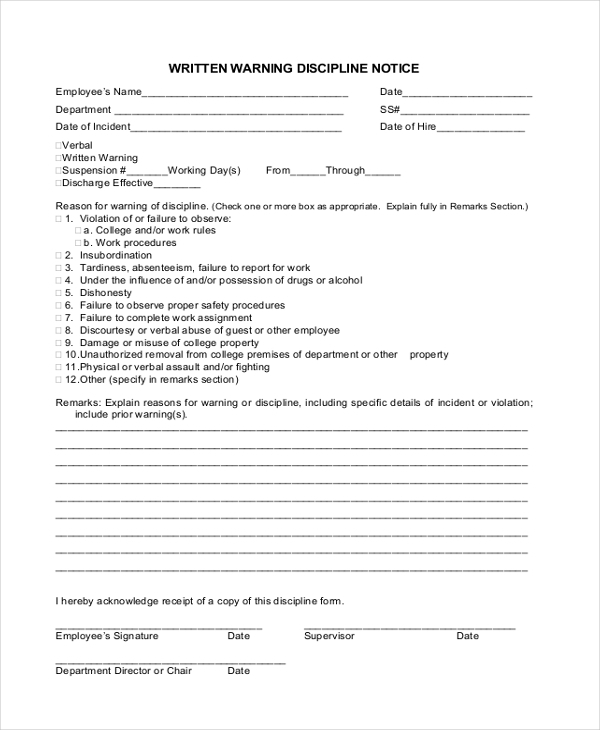 Warn your employees who have been noticed for inappropriate actions or behavior in the organization with this employee warning form sample available in PDF format online. Get downloaded and edit easily with personalized data. Try this employee corrective action form if you are planning to present the write up as a corrective and disciplinary action against any indiscipline employee of your organization. Download now. You may also see Employee Information Forms. 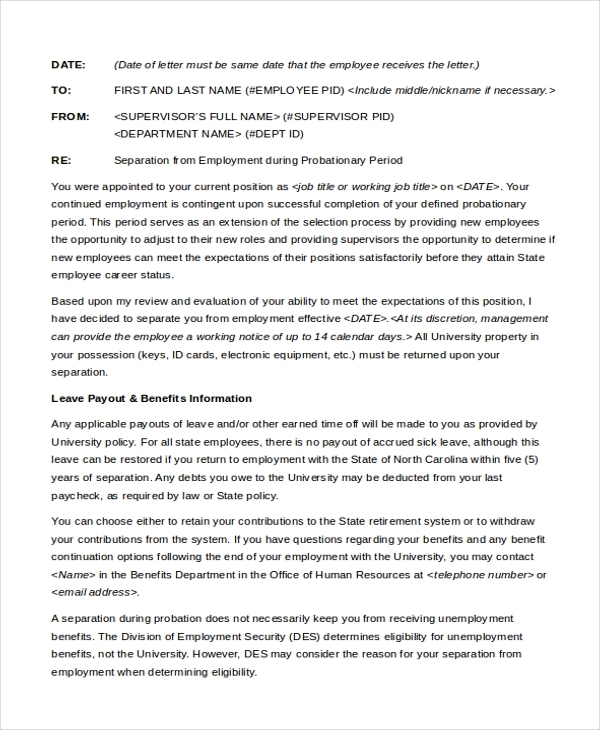 Download this form online if you want to send a formal notice to any employee who needs to be separated from the employment during the probation period. This word format can be customized easily to be framed in your own words. Why Employee Write Up Forms Are Necessary? The discipline and curriculum of an organization or office always need to be maintained appropriately. This is the way how organizational operations can be smoother and productive. But issues may arise with certain employees who don’t find it important to follow the necessary organizational rules and routines. You can also see Employee Status Change Forms. Whether it’s about taking too many leaves by employees, misusing the internet facility of office, taking too many breaks or anything similar an employee write up form can help managers, HRs or superiors issue a warning or information about decided disciplinary action to be taken against the employee under consideration. These are necessary to be used in any warning process, firing process or any disciplinary action. You may also see Employee Declaration Forms. When an Employee Write Up Form is Used? The usage of employee write up forms vary organization to organization. These forms are used by employers, managers, superiors, and HRs to report the poor behavior of employee with the explanation of warning or action taken against him/her. Mostly the write up forms created for issues warnings have room for the signature of the concerned employee. In such a case he/she made aware of the notice of their poor behaviors or performance and the consequent action that can be taken against them in the case of no improvement. You can also see Employee Complaint Forms. These can be utilized to offer multiple warnings for the issue or can also be utilized to issue a single warning before any disciplinary action to be taken. 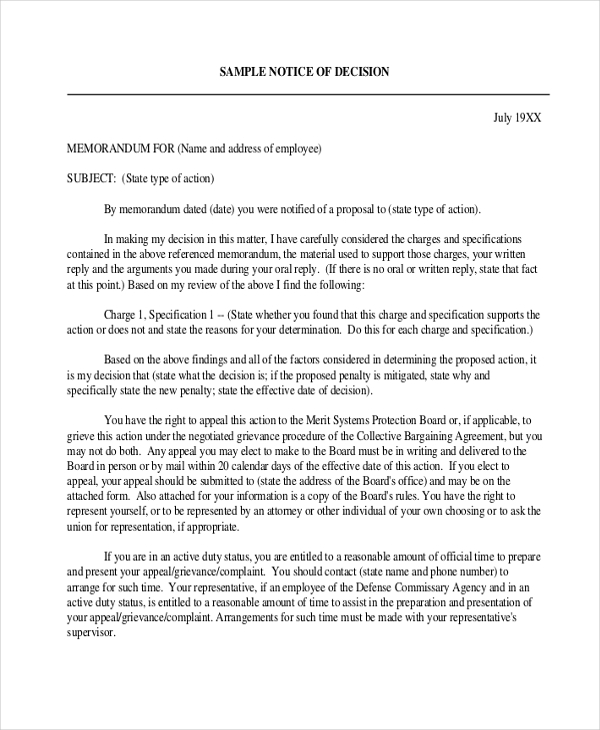 A write up serves as a clarification for both employer and employee. If you too need to issue warnings to your subordinates or employees for their inadequate performance or behavior then get the above-listed templates downloaded instantly. These templates will help you issue write ups inadequate manner while also having adequate information from the employee side. These can be customized easily to make as per particular requirements.